The rumors of Sony creating a color handheld similar to the T415 have proved to be correct. They announced in Japan today the PEG-600C. It is close in size to the T415 but the new model is .49 inches thick rather than .39. It is also .4 ounces heavier. Still, Sony crammed a lot into that small casing. It has a 320 by 320 pixel TFT screen that can display 16-bit color. It also has 16 MB of RAM and runs OS 4.1. It will be available in Japan on December 8 for 40,000 Yen, which is about $325. It is not yet known when a U.S. version will be available or at what price. Update: A Sony spokesperson would only say that they are considering releasing a version of the T600C in the U.S. but Sony never comments on unannounced products. He would say that the screen on the T600 is actually brighter than the one on the N series. It still has the improved infrared port from the T415 and the TV/VCR/etc. remote built into it. It also still has the same enhanced sound capabilities. It uses the 33 MHz Dragonball VZ and has a standard Memory Stick slot. It will come in two colors, silver and blue. It is also not yet known what Sony's plans are for the N610C, a model that has almost the exact same features as the T600C except that the N610C is larger. Keep in mind, if Sony releases a U.S. version of this model, it won't be called the T600C; It will be something like the T610C or T615C. The Japanese version of the T415 is called the T400. Update: While Sony has also introduced a sled for the T models that will allow them to use CompactFlash modems, this will only be released in Japan. It does not work with CF memory cards. It also has a built-in battery so the extra power drain from the CF card won't be more than the handheld can supply. No MP3, but otherwise top of the line SONY? Other than MP3, would this be top of the line SONY in terms of features and design? RE: No MP3, but otherwise top of the line SONY? There's no built in MP3 player but there is an accessory for it (see link below). They'd all ship by December 8. Very very cool. 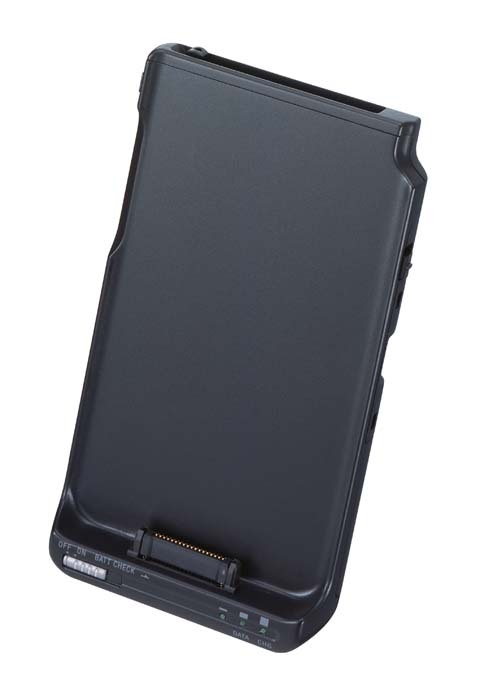 I'm not a big fan of adding a bulky sleeve to my device, but since this device is small to begin with, the sleeve might just expand it to be a regular PDA's width. CF would be great. It's the cheapest memory i've found out there. I'm afraid it won't be supporting CF Memory - just CF comms... so you still only have MS as a memory format. Are you quite sure of that?! Even if Sony doesn't support it, who said a 3rd-party couldn't hack it? "Power source to be supplied from the CLIE, music playback time approximately 4 - 5 hours. As for size 30×74×12 millimeter, as for weight 40 grams. As for bit rate 32 - 128kbps (sampling 44.1kHz) . The headphone and installation CD-ROM et cetera of inner ear type belong to the product. As for price open price (approximately market expectation price 1 ten thousand 3000 Yen)." Isn't that simply the same MP3 clip on that the S320 and the N600 can use, with a new connector for the T series? Yes. When the T415 was announced, they announced an audio adapter for it at the same time. It was described to me just like you just did, as the same adapter with a different plug. Yup, they didn't forget to include it. I think it's a better solution to make it a separate accessory since not everyone wants it. Also, it brings the price down. I love seeing the new units come out, but sheesh, I've gotta watch my spending. I have an n710c (now n760c), and my mouth is watering over this one. I'll have to hold myself back. I didn't think they'd be able to pull this unit off, at least not so soon. Palm and Handspring better get their acts in gear, because with all these new units, Sony's going to pull the rug out from under them. RE: Wow, they did it!!! I have a brand new 760c that I haven't even opened yet (the box is still shrink-wrapped). I'm thinking I don't really need the MP3 features, so I may sell it and get a 700c instead. What do you think I can get for the unopened 760c? almost what i had in mind except for a 66 MHz proc. may get this. Since I'm in Asia, I'll think it'll get here first. Especially with taiwanese fixation on all things Japanese. Put the story back up!!! Why'd the story get taken down??? RE: Special Edition m505's? NOT! Comparing to Sony, Palm is a BIG JOKE (in fact, same for all three "original" Palm manufacturers: Palm, Handspring, and Handera)! I am a certified idoit --- placed an order (M505, because the net price is around $300) over the weekend from Dell. With this new Sony Clie, I am sending tons of email to Dell to cancel my order!!! When the 710 is out....: m505 is thinner...! When the T415 is out....: m505's screen is colour! When the T600 is out....: Palm, anymore things left? When the T600 is out....: m505 has America RED !!! Let's see.... according to Palm's marketing history... Tiger Wood edition m505 (green)? Pamela Anderson Edition (blonde)? ... Sorry, but I just cannot stop joking at Palm's creativity and innovation!!! When the 710 is out....: none of the palm PDA can play MP3...! When the T415 is out....: the equiv class m500 is still using 160x160! Gee, Palm is really mucking it. To try and sell duds by calling it America Red and Patriotic Blue? Thank God somebody had the sense to send cArL Yankovich (or is he really Carl Yankowski?) to spend the rest of his days somwehere else where his jokes will have a more appreciating audience. But I guess one last joke from this joker is just too much to take. Maybe he thought he could kill 2 birds with one stone by sending leftover colored M505's to Kabul and write it off as Palm goodwill. Jeff Hawkins, can you please spare us from more bad jokes? just because M505 is not as advanced as T series. At least they created it! (ok, ok, it was 3com). MemoryStick, which I personally don't like. I'm happy with my T415: nice pda, great OS! The link to the CF adapter "sled" looks like it is using a CF 802.11 card which means no big, bulky Xircom sled like the m505 uses. This could be the Palm I've been waiting for. That's actually a wireless net card, the AirPetit, which seems to be very big in Japan right now. Don't know if it's 802.11b or uses cells ala DoCoMo. I just heard from my Sony contact that the CF sled will only be available in Japan. Those are PHS cards, 14.4kbps (analog) and 64kbps (digital/ISDN). This is innovation! We don't need someone telling me that this or that cannot be done. I knew you would say something and I was waiting. This is 25% thicker than the T415. They COULDN'T fit a color screen into the T415's shape. Yeah....so m505 can't fit in a m500 case....BIG DEAL! Tell Palm to do that.....or just eat dust! Keep in mind, it's available IN JAPAN. Granted, it'll eventually launch in the US, but when? Once it launches in the US, what if you get a bad unit? Sony is notorious for poor tech support. Plus, with all this innovation, why on earth is Sony focusing on making the thing a glorified remote control? I've got much better ideas for what my PDA can do - I wish Sony would focus more on that. If you insist on the timing of the new unit. And when Palm eventually does come up with a 320X320 display, God knows what kind of steps Sony will be taking? As for tech support, Sony will no longer be able to ignore buyers when CLIE captures 20% of the market, that is just too much to lose. Remember the Lexus story and how they manage to compete with Mercedes and BMW? i'm hoping palm won't come out with ANY 320x320 displays, and would just stick to the new OS 5 and making the 320x240 screens a reality. If we're still on small square screens (REGARDLESS of resolution) next year, then i'd be very very disappointed. 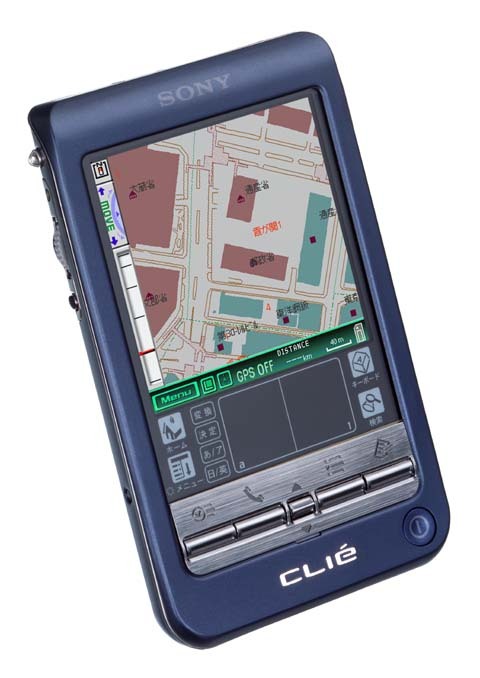 A color version of clie T series at the price point of about $350 US in December. funny that everybody shot that rumor down in 2 mins. The phrase "$350 US" is an international-trade designation meaning "350 US Dollars." It does NOT mean the device will be available in the U.S.
Good for the Japanese, but if it's not available in the U.S., then it's still a rumor out here.